I can't remember how this book turned up in our house for the life of me - I think it may have been given to Isla by someone at nursery, but it's proving quite popular at the moment as it's feeding into her current love of dandelion clocks. 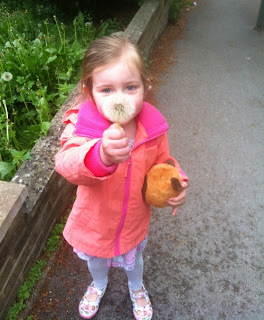 She loved the dandelions when they had bright yellow flowers and she loves them even more now they are big fluffy seed heads that she can blow or wave around! Christopher Nibble is a guinea pig and he lives in Dandeville with all the other dandelion loving guinea pigs, unfortunately they love the dandelion leaves rather too much and they disappear from the town. It's down to Christopher Nibble to solve the dandelion crisis. We love this book, the illustrations are really cute, it has a bit of a Charlie and Lola feel to it with lots of patterns used. I have been encouraging the children to do lots of planting and looking after flowers recently so this story really fits in with that too as Christopher Nibble goes about growing the towns favourite food! I love the quirky feel and the unusual story. It sends out a gentle message about conservation too. 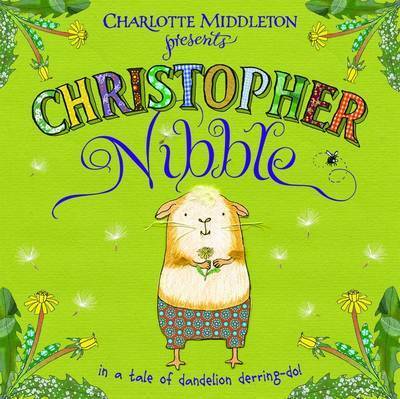 This really is a lovely book and I think we'll check out a few of the other Christopher Nibble titles, they're great for pre-school children!